Keeping your marijuana happy and healthy comes down to how carefully you care for them through each stage of a marijuana plant’s life. This is especially important in the younger stages of your plant’s life when they are at their most fragile condition. A marijuana seed that sprouts will split along the seam that joins the halves of its husk. Driven by gravity , the tail grows longer rapidly, screwing its way down into the soil until the root can supply sufficient leverage to raise the husk containing the two seed halves upright. From that position, the two halves fold out to act as biological solar panels that gather energy and begin a marijuana plant’s first chlorophyll production even as the tiny taproot sprouts hairlike feeder roots that stretch outward to strengthen its grip in the soil. In this article, we take a look at the ways to protect your seedlings through their most delicate stage of life. The key thing to do during this stage is simply to pay attention and keep tabs on every development or change that occurs in your marijuana seeds. When they sprout, the seeds’ seams will split and allow a white tendril to poke through within several hours of this split. This tendril will grow very quickly, moving downward until it’s deep enough for it to hold up the rest of the plant (namely the stalk and the seed husk). The husk, now split into two, emerges from the ground and functions as a sort of makeshift leaf – in other words, it absorbs energy that can be used to produce chlorophyll within the plant. While you see the stalk growing upwards, you can also be sure that more roots are sprouting and growing downwards at the same time. The first two leaves, completely unique from any future leaves that will grow, pop out of the middle of the seed’s split. These leaves are called sucker leaves and mark the beginning of more leaf growth. Two-lobed leaves will then grow from the middle of the sucker leaves. These two-lobed leaves usually resemble chicken feet, since they have three lobes. After the three-lobed leaves come two leaves with five lobes, and then two more with seven. Seven-lobed leaves are the ones everyone recognizes as the marijuana leaves. Two lobed leaves will then grow from the middle of the sucker leaves. These two-lobed leaves usually resemble chicken feet, since they have three lobes. After the three-lobed leaves come two leaves with five lobes, and then two more with seven. Seven-lobed leaves are the ones everyone recognizes as the marijuana leaves. 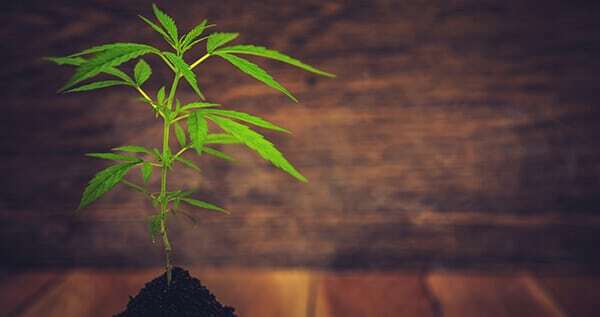 If you were able to keep your marijuana plants healthy throughout its entire sprouting stage, they would most likely go through a very productive vegetative stage. Protecting your young plants is about more than just survival: it’s about investment in your future harvest. Read the article How to germinate marijuana seeds for more about germinating tips. This article covers the various elements you will need to keep a constant eye on to ensure the well being of your seedlings. These elements are protection, water, nutrients, heat, and sunlight. You will need to protect your young plants from more than just discovery by the authorities. Even if you live in a location where growing marijuana is legal, you have plenty to worry about with protecting your seedlings. You should keep your plants in some sort of protected area, such as a rooftop, and shelter it using some sort of a transparent, plastic dome or bubble. These domes can keep your seedlings from being eaten by insects, rodents, or other pests, and they are easy and cheap to make yourself. Simply slice a clear plastic bottle in half, then recycle the top half and keep the bottom half. You should cut small slots around the edges of this half so that your young plant will have some airflow. Place the dome over your little plant, completely covering it. This will have the additional bonus of insulating your plant in case an unexpected frost occurs. In my free Grow Bible, you will find more DIY hacks for your grow. In addition to insulation and protection, your seedlings will need the most important elements on Earth: water and sunlight. You have to constantly keep the soil and the seedling moist around the clock, and you need to make sure they are receiving plenty of sunlight. If you live further north, you could have some more trouble with this since your spring days will be shorter than latitudes further south. One big problem that can happen to outdoor growers is their seedlings not receiving enough sunlight. When this happens, the plant stretches taller and taller in an attempt to reach more sunlight, and then it is too tall to hold itself up any longer. If you have space and resources, you can try sprouting your cannabis seeds inside of a closet to begin with. Using the proper equipment in this environment can give your young plants plenty of sunlight, giving them enough energy to sprout large, healthy leaves right from the beginning. This type of growing would also ensure that their stems won’t get too long and weak; rather, they will be short and strong. You will be able to avoid the hassle of stabilizing tall, weak stems with sticks. If they don’t do this while the plant has leaned to the ground, it could begin to rot. That being said, if you start to grow your seedlings indoors, transplanting them later will be necessary, which presents its own difficulties and safety concerns for your young plants. Ultimately, it depends on which option is best for you. One common problem that occurs when trying to care for a seedling is giving them too much water. It is actually less of an issue having to do with too much water, but actually has more to do with too little oxygen reaching your plant’s roots. This happens most commonly with seedlings being grown in containers since water can only go so far as the walls of the container. If your plants are being over watered, you will most likely see symptoms such as drooping leaves. There are plenty of ways to avoid this, however, as long as you keep reading for a better understanding. Your planting situation is the most important factor that comes into play when considering how you have managed to overwater your plants, and how you can fix or avoid the issue. Since a young plant’s tiny roots absorb much less water than their more mature counterparts. If you water as much as the container can hold, these tender roots will not be capable of taking it all in. This situation, occasionally referred to as “overpotting,” leads to over watering. So how do you prevent this situation from happening? The best thing to do is to begin your seedling’s life in a smaller container to begin with. Once they have grown a fair amount, you can move them to a bigger container. If it’s too late and you need to fix the issue, simply direct your watering to a specific area: a little circle right around your plant. Once the topmost inch of soil is dry again, you can do another round of watering. You can only begin watering normally. If you plan well enough in advance, you can have a separate container for each of your marijuana plants’ stages of life. If your plants will be living in containers for the entire growing season, you will need to know in advance the size of your last container. In other words, you will have to have a good idea of how large you would like your plants to become. Because roots grow more rapidly when they are left in one container for a long time, fewer transplants mean a larger size plant (and therefore container). Take that into account when planning your container sizes. You can plant seedlings in very small individual containers, such as a solo cup. You can’t keep them cooped up in a solo cup forever, though since their roots will quickly outgrow the small space. If your plants are left in a small container for too long, they will become “root bound.” This means that the roots have wrapped themselves around the outside of the cup, keeping water on the inside from escaping. If your plants’ container does not have an efficient drainage system (i.e. holes punched in the bottom of the container, plus the right kind of soil), overwatering will quickly become a problem that could be life-threatening to your plants. One way to keep this from happening is to start growing your plants in a soil that drains well from the very beginning. Soils that are clay-based, for instance, retain water and, therefore, should be avoided. You can also begin with a smaller container, which would help prevent the issue that was mentioned above. Make sure your container has lots of holes where water can drain from. If you ever notice that water isn’t draining as fast as it should, you can add perlite to your soil to increase the oxygen content. Don’t water your plants quite as often until you notice them drinking more, or try using a Smart Pot instead of a normal pot. If you follow these tips and are careful about watering your plants, you should be able to avoid overwatering them altogether. If you’re sure you haven’t been watering your plants too often or too much and they are drooping or wilting, the culprit could actually be a lack of water. Sometimes people who know about the common occurrence of overwatering seedlings have overcompensated, therefore actually watering their plants less than is required. The roots of your plants need to constantly be able to access water. Plants lose the water they have absorbed through their leaves in a process called transpiration. They do this by sucking up the water from the roots like a straw. If this process keeps going and the roots down below are not receiving enough water, the plant will undergo some serious problems. If you are able to visibly notice your soil separating away from the container it’s in, you probably have an underwatering problem on your hands. If your soil is enriched with nutrients and you underwater your plants, the effects will be even more devastating. Your plants will turn a dark green color and will have twisted new growths of a strange color. In this case, the only thing you can do is give your plants more water to re-establish their roots and begin growing once again. If they receive enough water to fight these effects, they will probably be able to combat this situation. Giving your plants nutrients can come with its own issues. If you give your plants too high a dosage of nutrients, for example, it will turn into nutrient toxicity. Your plant’s leaves will have tip burn and turn darker in color. Nutrient toxicity can be caused by using a “hot” soil or a type of soil with a lot of nutrients. As long as you are watering your seedlings enough, they should be able to grow out of nutrient toxicity that comes from using hot soil. Some soils are “slow-release,” such as Miracle-Gro. Avoid these soils at all costs, as they will not help your plant be healthier – in fact, it makes them even more susceptible to nutrient toxicity. If you provide your seedlings with nutrients when they are too young, they might have a sort of nutrient overdose. As long as your initial potting mix is high quality, you shouldn’t need to worry about adding any more until after a minimum of a few weeks. If you feed your plants with a large amount of nutrients all at once, you could end up with nutrient toxicity in less than a day. If you’re using a nutrient schedule that comes with the store-bought nutrients, half the amount it says and see how your plants react before adding any more. I’ve had a personal line of fertilizer developed. My Seedling Fertilizers are perfect for your little ones. If you use the wrong type of nutrients or bought a potting mix that isn’t right for cannabis seedlings, your plants could end up with a nutrient deficiency. You can identify this problem by yellowing, folding leaves starting to form on your plant. They will eventually wilt and drop off. Theses leaves are located on the bottom of the plant, but if they are located only at the top, then nutrient deficiency probably isn’t a problem for that plant. Nutrient deficiencies always affect your older leaves first. You can avoid any such problems by making sure that your plants have the right type of nutrients and by providing more nutrients as the plants “use up” their current soil. Additionally, if you’re growing your plants without soil, this doesn’t mean that you don’t need to provide nutrients. Problems could also arise if the soil isn’t kept at a balanced pH level. Even if the right nutrients are present, with the wrong pH level, your plant could experience nutrient a deficiency. If you are watering your plants poorly, this could also have a nutrient-related effect on your plants. Additionally, keeping your plants in a container that is too small for them for too long will cause nutrient deficiencies, simply because it will become root bound and will keep your roots from working properly. For a list with all nutrient deficiencies check the article Nutrient deficiencies in marijuana plants. The temperature should remain near 73 degrees, but if it’s too hot then simply move the lamp further away from the plant. If your seedlings are experiencing temperatures that are too high, their leaves will start to curl upwards and form a canoe shape. You can solve this problem simply by lowering the heat. These symptoms occur more easily when your marijuana plants are also not receiving enough water. If you’re germinating your seeds indoors it’s best to place your seedling in containers under fluorescent lights , since the lights do not use too much power and don’t emit much heat, allowing you to place them quite near the plants (2 to 4 inches). Make sure to have the cfl on at intervals of 18 hours on, 6 hours off. If you’re using HPS grow light place them as close to the seedlings as possible but don’t let temperature exceed 77. If you’re germinating outdoors it’s different. It is safe to say that sunlight is most important when your plants are first starting to sprout. Don’t be afraid of giving them too much light – it is almost never enough, as long as you keep your plants’ other needs in check (i.e. keeping their soil consistently moist). It will be obvious when you aren’t giving your plants enough light since their stems will be somewhat white-colored, tall, and thin. Basically, it’s your plants’ way of trying to reach as much sunlight as possible. That being said, every plant has something called their “light saturation point,” or the point when plants can’t utilize every bit of sunlight that they are being exposed to. As long as you keep your lighting within a reasonable amount, your plants will probably not reach their light saturation point. If they do, it turns into a waste of light, electricity, and time – when a plant is receiving too much light, it actually does not grow as quickly, since there is no point for it to grow bigger for the purpose of receiving more sunlight when it already gets too much. A simple way of reducing the amount of light your plants are receiving is by moving your lamps higher, making them further away from the plants. If they need more light, move the lamps closer. It’s as simple as that! Sometimes people think autoflowering plants don’t require light to grow. That’s incorrect. Autoflowers need light to grow and develop, they just don’t need light shortage to initiate flowering. So, be sure to give your autoflower seedlings enough light to set up for a strong plant. Here’s my selection of autoflowering strains. Marijuana plants that are stretched out tend to be that way because of certain environmental factors. Stretched out marijuana plants will not produce sturdy stems that can support several branches, buds, and leaves. So, it’s important to ensure that the marijuana plants aren’t stretching out too thin. A simple solution to this problem is to bend the stem back and forth. While this might seem to put a lot of stress on the plant, it actually forces the stem to tear and then rebuild in that space. The stems become much sturdier as a result. Thanks for the tip and sharing medMUser. By Stop Cutworms On Marijuana Plants Now! By Stop Crickets And Grasshopper On Marijuana Plants Now! is it okay to plant tour seeds into soil without germinating them in water first? how long should it take to see sprouts? Hi me, all grow guides will be send to you when you start the download here: http://ilovegrowingmarijuana.com/marijuana-grow-bible. Please contact [email protected] If you have any issues with the download. Wher is my free book!! I didnt get one either. Actually David, He said this ..."If you're using HPS grow light place them as close to the seedlings as possible but don't let temperature exceed 77."